Long time, no post. I’m trying to get back in the swing of things here on the old blog. I lost my mojo there for a while, but it’s slowly returning, so thanks for sticking around. I realized that I never updated here with a finished picture of the new paint color in the sunroom. So, let me FINALLY get around to posting some pictures of it! The color on the walls is Sherwin Williams Sea Salt. It’s oh so light and airy and pretty in the room. It’s a total transformation from the dark muddy paint that was in this room when we bought the house. 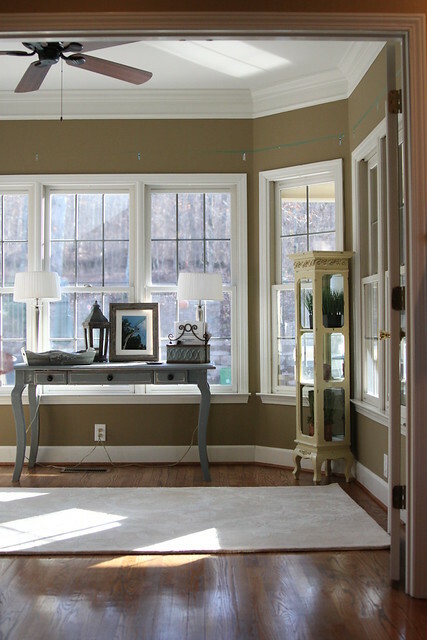 When you last saw the sunroom I was asking for you to vote on a paint color. Sea Salt wasn’t the winner, but the North Star turned super periwinkle on me so I decided to go with Sea Salt. Here are a few “Before” pictures, just to see how far it’s come since we first moved in. 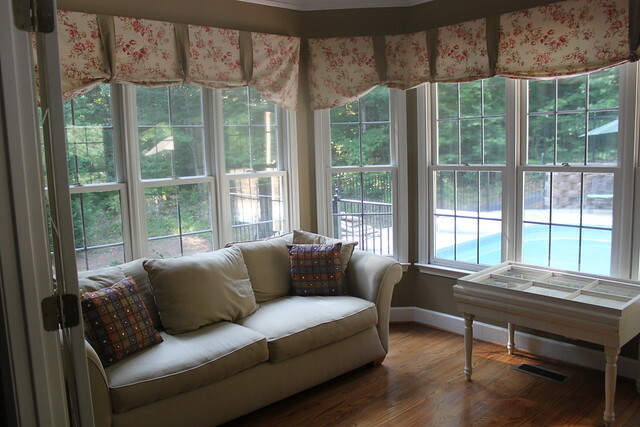 Those valances are long gone now. But, with a fresh coat of paint it brightened right up! I love this color. That room was in limbo for a while after the paint was finished because I was trying to find the perfect chair or loveseat for the space. The sofa that we had was way too big, but I loved having a place to lounge in there. 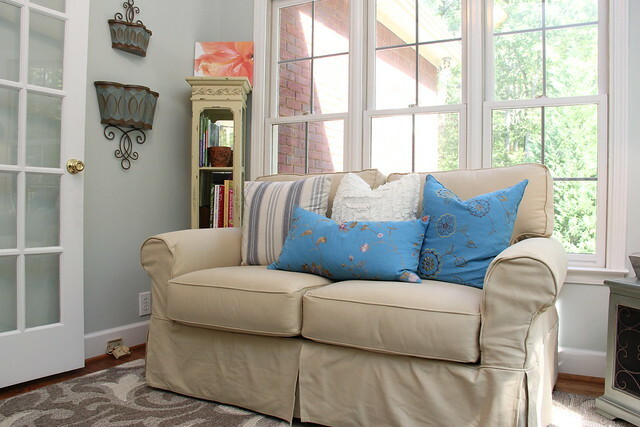 I kept my eyes peeled and finally found a steal of a deal on this Pottery Barn-esque Nantucket loveseat from At Home Furnishings in Homewood. I snagged this sucker for just $399.00 on a facebook special! WOOT! It’s got a removable slipcover so that was a huge plus for me. It’s also the perfect size for the small space. Over behind it is the curio shelf that J bought for me many years ago, filled with all my gardening books. I am still using this little blue table from the lake cabin as a side table. I like it because it fits right below the windowsill so it doesn’t obstruct anything. I did strategically place the loveseat in that spot to hide the ugly pool pump and HVAC unit condo complex we’ve got going out in the backyard. 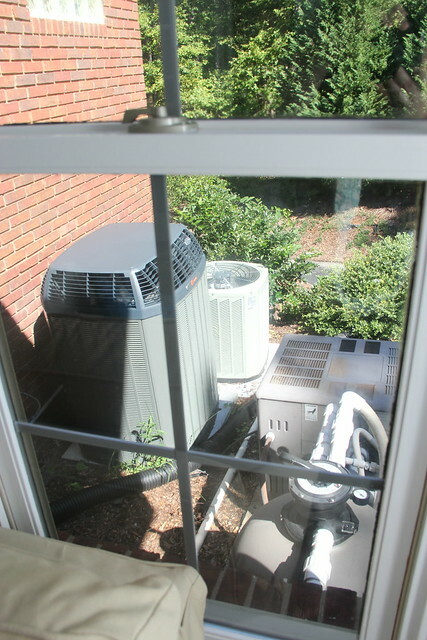 This view is not something I want to see out the window. Across the room I angled my blue desk and chair to balance things out. I wanted all the seats in the room to be facing towards the pool (and away from the pool PUMP) since that is where some of the best views are in the house. I had this white shelf from my old house that I never could figure out what to do with. It’s supposed to hang on the wall, but I never got around to it. Finally I just laid it on it’s side and used it as a platform for my favorite photo frames. Works pretty well I think. 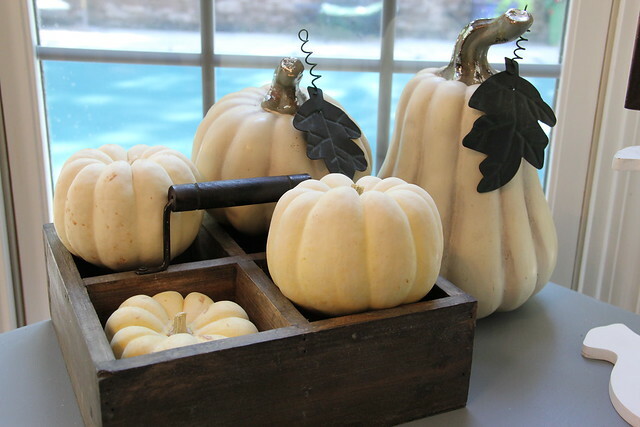 The pumpkins will go away once Fall leaves us, but for now they are cute in that room. The new paisley rug came from Home Depot. I have a thing for paisley rugs. This one is a nice silvery-gray color so it really brightens it up in there. Plus it’s an indoor/outdoor rug so hopefully it will be a little more resistant to the fading from the sun. EDIT: I just found out on the HD website that this rug is for indoor use, not outdoor. It is resistant to fading, though. I couldn’t remember the name of it last night but thankfully my husband did this morning! It’s called Forte Rug by Mohawk in Taupe/Flesh/Ivory. Why they felt the need to include the word flesh as a rug color I don’t really know. That kinda heebs me out. But I can promise that there is nothing fleshy about it in person. 🙂 You’ll have to call or check your local store to see if it’s in stock. So, there you go! 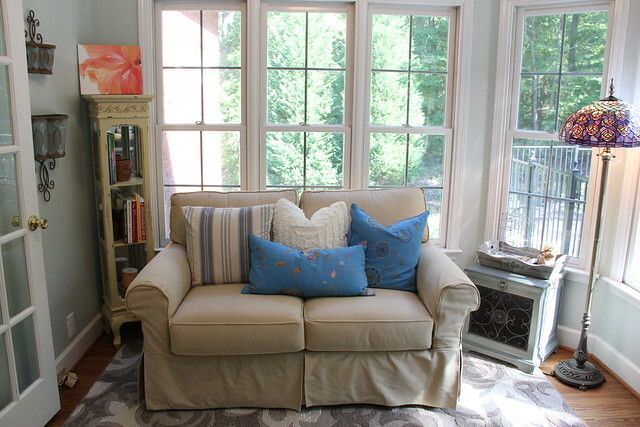 Finally after, um, two short months of waiting, you get the big sunroom reveal. I love it! I’m really happy we chose to lighten up the paint in our house. It makes me so happy. 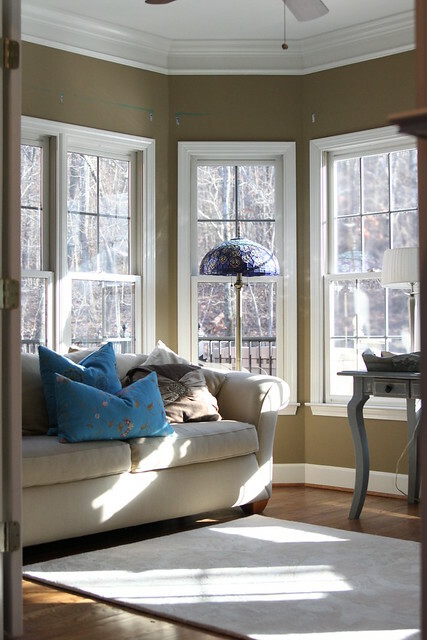 Beautiful, just like a sunroom should be! That rug is so cute too! Just lovely Beth! I do like the Sea Salt colour – so light on the dreariest days I’m sure! 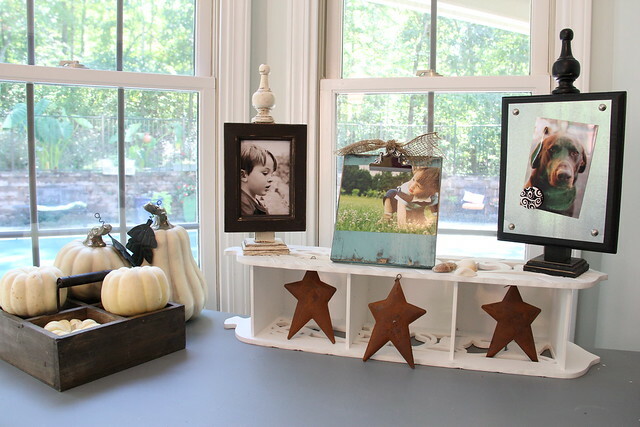 You’ve accessorized very well too, love your wooden photo frames and the rug is gorgeous! love!! My fav is that rug, and brilliant of you to get an indoor/outdoor where the sun is bright…I would never have thought of that – brilliant I tell you!!!! 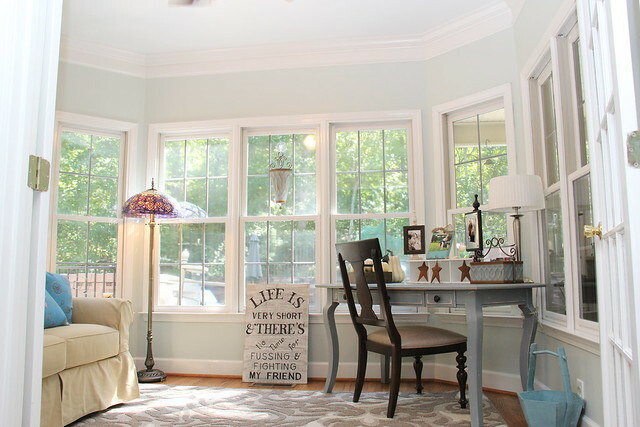 Love the fresh, new look of your new sun room. Such a welcoming feel… great job! 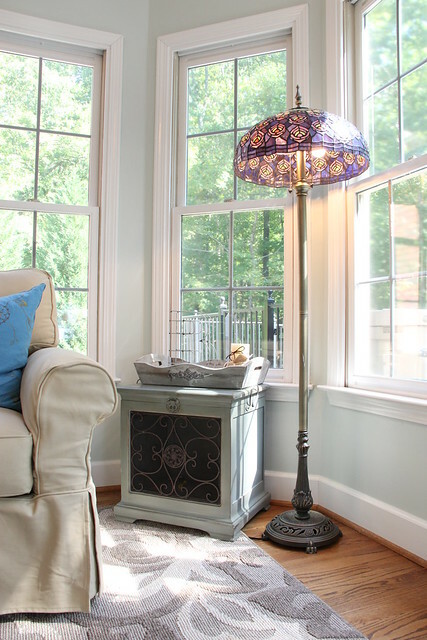 And of course I love the blue (my new favorite color) that you incorporate into all your rooms. Beautiful Willow House product additions as well. Happy Styling! Wow! What a beautiful transformation!! Great job!! :). Lovin that rug… ALOT! It’s so pretty! 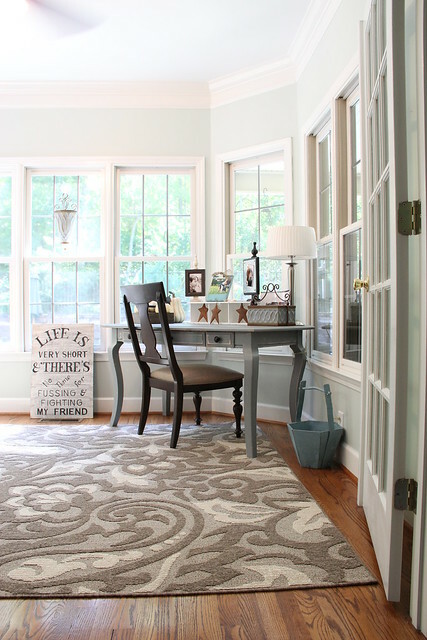 I love the color and the rug is really fabulous. Looks perfect and none-to-fleshy. I bought my sign from The Foundary, but here is a link to another one just like it. Finding Condo Enclosures has been very hard lately, I have not been able to find any. 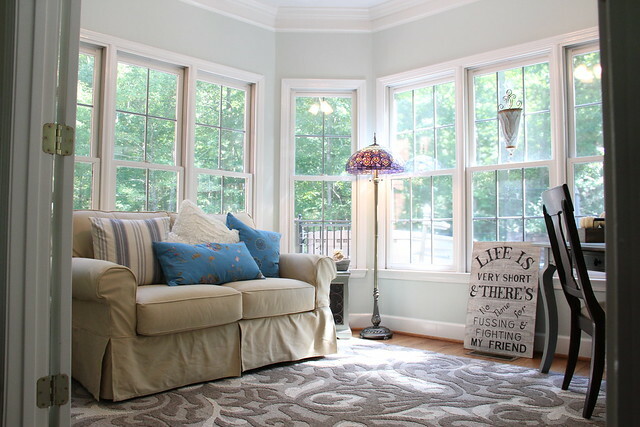 Your sunroom looks great!! So bright & airy. I love it. Oh, and I just ordered the “flesh” rug 🙂 My, oh my, how that makes my shudder. I love this room! I’ve just picked out Sea Salt for my sun room, so this was a great visual. You decorated it so beautifully. I love the desk/chair combo. Do you know where they were purchased? I asked the same question on Houzz.com as well. Great room! I’d love to know that as well. I’ve been looking for the exact size for my home office. 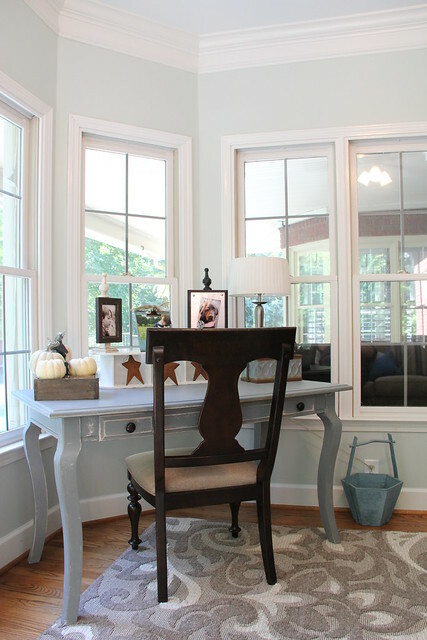 What color white trim paint did you use in this room with sea salt? That is a wonderful room! I love the feeling that I can just imagine looking at the pictures. So is Sea Salt a blue or is it white with a hue to it? I’m going to look today. Our house is painted a color called Caravan by Pittsburgh paints. It’s pretty and neutral but darker than I care for. Hi! any chance you painted that grey table in your sun room? I have a desk I want to paint the same color and I would be so appreciative if you could share!